Treasure Valley Casino is a governmental enterprise of the Chickasaw Nation, (“Nation”) a federally recognized sovereign Indian tribe. 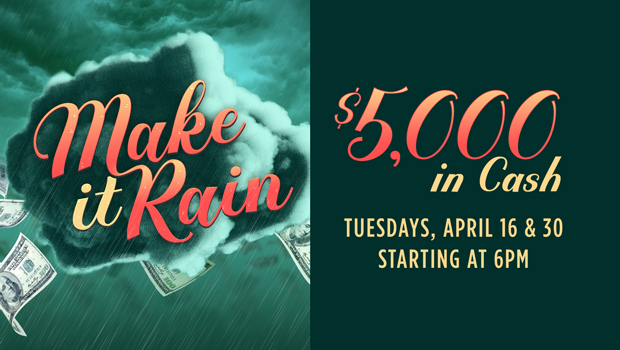 Treasure Valley Casino is giving away $5,000 in cash during the “Make It Rain” promotion. Patrons must be 18 years of age or older with a valid photo I.D. and be a Treasure Valley Casino X Card member with complete and accurate account information to participate. The following individuals or entities are not eligible to participate or win during this promotional activity: employees of Treasure Valley Casino, employees of the Nation prohibited from participating as set forth by any of Nation’s policies, regulations, or laws, anyone who has been barred from any of the Nation’s gaming facilities, or any promotional sponsors. Patrons will receive one (1) entry for every five (5) points earned on their Treasure Valley Casino X Card. Partial entries will not carry over once drawings begin. Patrons who are new Treasure Valley Casino X Card members will receive five (5) entries upon initial enrollment. Every Sunday throughout the promotion Patrons will receive 3X entries for every five (5) points earned on their Treasure Valley Casino X Card. On Tuesdays, 16th and 30th, 2019 random Drawings will be held from 6pm until 9pm and a total of $2,500 in cash will be given away each night as: five (5) $100, four (4) $150, two (2) $200, and four (4) $250. Patrons will play a game to determine prize amounts. Patrons are responsible for activating their entries by properly inserting their Treasure Valley Casino X Card into an electronic gaming machine, and removing their Treasure Valley Casino X Card from the machine within one (1) hour of drawing times. Patron(s) must be present to win. Winner(s) will be announced and have three (3) minutes to respond. However, if the announced winner does not respond within the allotted time a new winner will be drawn. Limit of one (1) cash prize per Patron per night during this promotion. Winner(s) are responsible for all applicable taxes. Winners will receive W2-G and/or a 1099 tax form, when applicable provided by the Chickasaw Nation.